IKEA SPOTTER: No 'Manda is an island. Okay, I admit it. I am not a full IKEA maven. My IKEA knowledge is weakest when it comes to cabinetry. Because I've always been a renter I rarely pay attention to IKEA kitchens. I may drool a little at the showroom displays but I don't take the time to get to know the different systems. The mavens over at IKEA Fans are constantly spotting IKEA kitchens in commercials and print ads but on this blog I need your help. 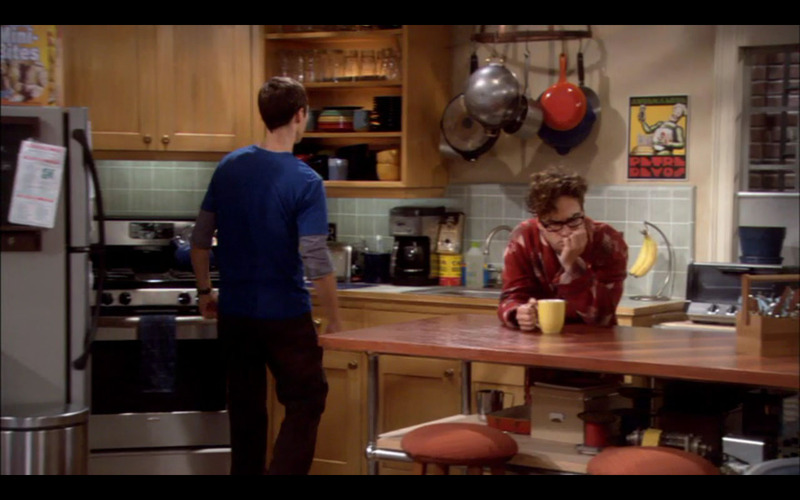 I previously posted about Penny's Apartment on The Big Bang Theory but purposely avoided mentioning the kitchen. I want to say I am 90% sure Penny's cabinets are IKEA. But, since 90 if way less than 100 when you are stating something on your blog - What do you say? The boys have a similar type of cabinet over in their apartment. So, how far off the mark am I? Did I do good or are you shaking your head at me?? Let me know in the comments. Also, if anyone knows where I can get her roman blind I will love you forever. I have a slight obsession with those shapes as anyone who has seen my home can attest. I love Ikea kitchens too, but know they're only a dream in my current home. Unless I build an addition. I want to know where to get the exact roman shade that is in pennys kitchen.. I can't find that material anywhere..